Cool drink on a hot summer night. 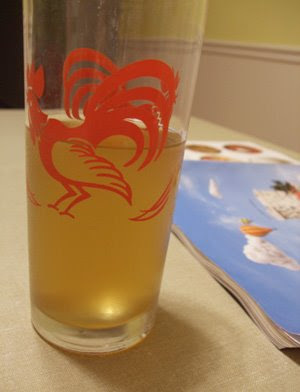 After we brewed beer, MVH steeped the spent grains to make a delicious iced-tea-like beverage. He was inspired by a drink he had on a business trip to China. Half a gallon of boiling water was poured over the grains, and they steeped for about an hour. The liquid was drained off, and two tablespoons of sugar were added to the drink. The result was a deliciously malty concoction with a bit of earthiness. It was sort of like iced tea, but it lacked bitterness. It was an interesting way to upcycle materials. I think we’ll try it again the next time we brew. I’m curious to taste a beverage steeped from the spent grains of another beer. What would “stout tea” taste like? Smoky, maybe? If iced tea is more your speed (or you don’t have a batch of spent grains lying around your kitchen), I recommend Sportea. Follow the iced tea directions on the box. It’s light and just sweet enough that I don’t use sugar or honey.